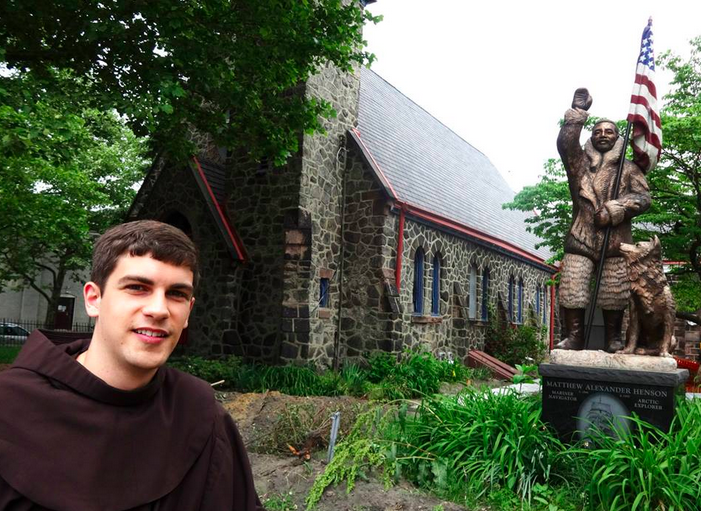 One of the bright spots of Camden: statue of the first man to the reach the North Pole. Vacation is over and it’s on to the next thing: summer assignment in Camden, NJ. If the first 24 hours here are any indication of how the summer is going to go, it’s going to be a full summer. I hit the ground running the moment I got here last night: after evening prayer, the four resident friars and I went out to dinner and an italian ice where, despite being in the next town over, we ran into two of the Franciscan Volunteer Ministers living near the church as well as a handful of parishioners. I spent the rest of the night unpacking my things and rearranging my room, and it was on to the next day. Morning prayer started our day at 8:10 (a welcome change from 6:50 during the school year) followed by a scheduling meeting with Fr. Jud Weiksnar and a walk around the neighborhood. Besides coordinating a community garden across the street, St. Anthony’s is highly involved in the development and safety of the adjacent park. With the student leaders, the community has orchestrated the cleanup of the park, the painting of the benches and trashcans, and most recently, the addition of lights and the removal of a rundown tennis court for more green space, a process that we were thrilled to find had started today. From there, it was off to Francis House, a ministry on campus for HIV-positive men and women in the area looking for a good meal and, more importantly, love and respect. People come to listen to music, play games, do puzzles, and to just talk many days of the week. Today, Fr. Jud and I went for a quick prayer and lunch, but I imagine that I will be spending a lot of time there this summer. At that point, the day was just heating up (literally… hot day in the habit and no air-conditioning). Camden may not be the ideal destination for many people, nor is it the most beautiful city to look at, but trust me when I say that it is an interesting city with a lot of history. With Fr. Jud as my guide, we explored East, North, and South Camden, highlighting the good, the bad, and the ugly (and there was a lot of that). Camden is a highly depressed city with as much abandoned property as it has drugs and violence, and yet, amidst all of the stereotypical things one would expect to see in such a place, there are more than 100 community gardens, historic sites, and areas of recent revitalization, not to mention two universities and a growing hospital. One park in North Camden recently received a multi-million dollar grant to put up new fences, basketball courts, bathrooms, and great sitting areas, and honestly looks wonderful. 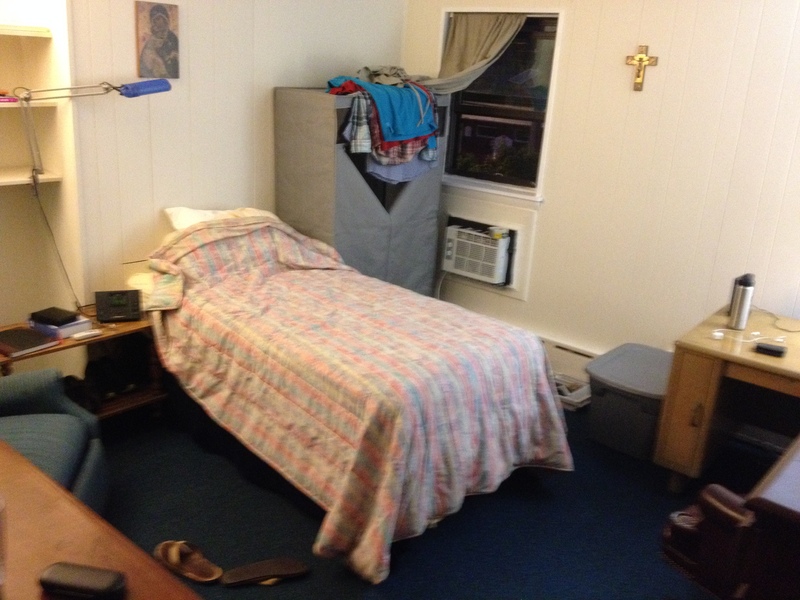 My fourth “sacred space” as a friar. With so much to see, we had to cut the tour short to rush back to the church for a weekly Student Leaders planning meeting. Joining the FVMs, the friars and a few adults hold weekly meetings with 8th grade students to empower them in government and community planning. Today, the focus was on the July trip to D.C. to meet their representatives in Congress. A little break in the day allowed Br. Juan and I to run out to Good Will for a quick shopping spree (4 t-shirts for less than $5!) and it was back to the friary for prayer and dinner with the FVMs. While friars are all very busy people, I respect these friars for putting a high priority on community prayer, praying six days a week at 8:10 and 5:15 without exception. Inviting the FVMs weekly is a great way to welcome lay volunteers into our lives and to evangelize in a comfortable setting: prayer and food. But wait! There’s more! After dinner and clean up, Fr. Jud, Br. Juan, one of the FVMs and I went to a parishioner’s house for a bilingual rosary and fellowship. For me, even as someone without as great of a devotion to Mary and the rosary as other friars, it was a great experience: unlike most things at church, this gives us friars an opportunity to be invited into our parishioners lives and to served by them, a reversal of roles and a step out of our comfort zone into theirs. All in all, I did very little but had a full day of exploring and experiencing. I’m sure tomorrow will be much of the same, and it will probably be a few weeks before I work myself into a comfortable routine. Until then, I’m remaining open to new experiences and new people, enjoying my time here in Camden. Yes, it seems those does that we do “nothing” are the ones that are the most God filled. Thank you for sharing with us. I appreciate your telling us about your first day in Camden, NJ. Sounds like a full summer is opening up for you. You are in my prayers. I love your optimism and faith.